Apple's expected 2018 iPhone lineup. To achieve that goal Samsung is in "full throttle" development of InFO (integrated fan-out) packaging technology, and also claims to be ahead of TSMC in production using 7-nanometer extreme ultraviolet lithography, or EUV, according to DigiTimes sources. TSMC's latest InFO technology has reportedly cleared verification from Apple, allowing it to snap up "A12" processor orders for this year's iPhones. Samsung has even dropped its order quotes for EUV by 20 percent, hoping to attract business from a variety of companies, but supposedly with "little response." This is thought to be because of quality and yield risks with 7-nanometer EUV, something that TSMC is still struggling with. TSMC may not fully integrate EUV into production until it moves to 5-nanometer chips. Even Samsung could potentially focus its initial EUV use on chips for its own Galaxy S10 phones, despite the appeal of a client as large as Apple. TSMC has boasted that its InFO method reduces the thickness of chip packaging while improving processor speed and power dissipation. EUV is an advanced method of printing the actual circuitry, but complex for a variety of reasons, such as requiring a vacuum due to the fact that all matter absorbs EUV radiation. Samsung was once the exclusive manufacturer of Apple's A-series processors for iPhones and iPads. As the two companies increased competition and legal battles, though, Apple began migrating to TSMC, which now enjoys a monopoly over supply. That could be a reason for Apple to bring Samsung back in, since it could force chip prices down. Samsung is still enjoying business from Apple however as the exclusive supplier of display panels for the iPhone X. 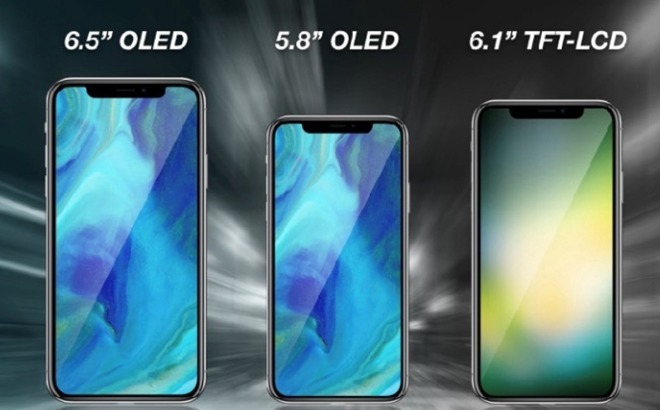 The company remains the only OLED manufacturer with capacity to meet Apple demand, and is expected to hold onto that role with 2018 iPhones, though the mix could diversify in 2019.